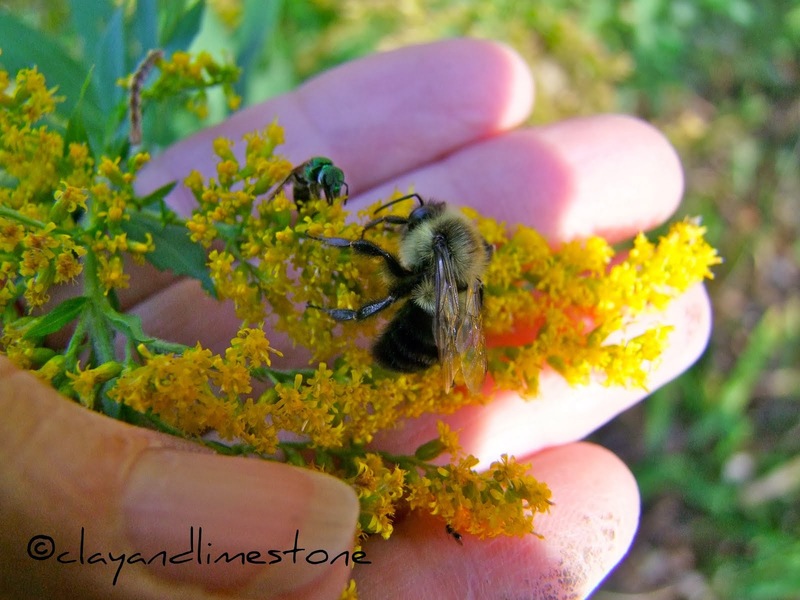 clay and limestone: It's Spring and This Gardener's Thoughts Are On Pollinators! It's Spring and This Gardener's Thoughts Are On Pollinators! I can't help it! My thoughts almost always go to pollinators. You can't blame a gardener for getting excited. The bees have been out and about since late winter; and, now the beetles, hoverflies, skippers and the butterflies are here. The garden centers are fully stocked and as a certified plantaholic~I have to remind myself every time I visit a nursery to honor my garden rules for plant acquisition! Let me be perfectly honest! Even though the preferred plant in my garden is a native that is endemic to the Central South/Cedar Basin, I have garden friendly exotics snuggled right next to them. I truly cannot imagine gardening without spring bulbs, herbs, lantana, native wildflowers from the Southeastern USA, zinnias, and my beloved daylilies. My thoughts are almost always on how I can make my garden pollinator friendly, lovely to look at and fun to visit. PPS. Because it bears repeating~ Never, never, never, ever, use pesticides in your garden. PPPS! I've been meaning to link to Clare/Curbstone Valley's wonderful posts on bees and bee keeping. Go here to see her most recent one. Couldn't agree more! Pollinators are a blessing to the garden and I'm so happy to have them here in mine. Just yesterday at the Gulf Coast penstemon there were so many bees the plant was dancing! Happy Spring Gail! You're so good at reinforcing the value of pollinators! You have so many in your garden ~ I can't believe there are butterflies already! Haven't seen any here yet and probably won't for at least another month. No problem restraining yet on the plant purchases either since our nurseries are not fully stocked ~ one more month tho and I may have to come back and re-read your reminder! Are you going to get your stock pond set up this year?? I'm kicking myself for not having sown some Phacelia up at the allotment. Not too late, will take some up on my next trip - thank you for the reminder! Great post, and I too am enchanted with the Curbstonevalley hive. Then there's the native pollinators. It's just fun! Hi Gail. I find myself thinking about pollinators more when purchasing or growing plants now too. More so since I have saw such a decline in the Honeybees around my home.It has also caused me to now watch more on the ways I get rid of some pests without killing the pollinating insects. I love your pollinator pictures. Your love for these creatures really shines through. Today I saw the first bumblebee. I tried to get a photo, but I scared it away. What a change from last fall, when I could stand right next to them & they didn't care. Bees, butterflies, toads and frogs, hummingbirds, winter birds, and, again, No Pesticides! :-) Best wishes, Gail. You have a lovely blog. btw: how are you able to have your photos be so large? I know I've read the instructions somewhere, but it's been a long while. Thanks, friend! It's an exciting time, waiting for the buzzing friends to come by, though lucky you to have had bees since late winter! 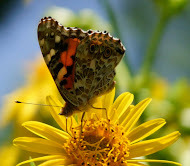 Just beginning to notice a buzz in the air around central CT - love your vibrant pictures! Lovely pictures! I have yet to see any bees around here but now that things are slowly starting to bloom hopefully some will be along soon. Really great photos you took of the pollinators. I liked your purchase rules too. I noticed last year that the bees returned in my garden unexpectedly after years of decline. I am hoping this is a good sign. I look forward to them buzzing back again, all shapes and sizes too. Nice info, Gail. I always try unlikely plants here :D and experiment with them - I just can't resist them temptation of growing exotics though. I'm having to think like that aswell now before I make a purchase. I just bought some teasel for my pollinators - a plant that years ago I would have ignored but not nowadays. I saw my first bumblebee in the garden yesterday! I was so excited, but I was cleaning up the area, and of course didn't have my camera with me. Beautiful photos as always, Gail. The last one is a good reminder that a lot of annuals are favorites of the pollinators, too. My lantana was a butterfly magnet last year--I'll definitely be planting more of it this spring! Great post--the pollinators will thank you. I did not dig up my garden this spring because it was so wet. Henbit with an amazing number of wild bees, honey bees, carpenter bees, and wasps are all over it so I hesitate to dig it until it's gone. Maybe this was the way to go. I try to buy plants that appeal to the pollinators as well. If honey bees are all over the flowers, then I know it will be good for my honey bees. Wow! So glad I found your blog site! Your photos are outstanding and love your love of all things pollinating on our behalf! I just got a swarm of honeybees settling in the branches of my front yard oak tree...wish I had a hive to tempt them into moving in! This is lovely! I'm excited about bees and hoverers and teeny flies, too! I'm taking such delight in how much the bees like the borage, in full blossom! This is a beautiful informative post. Thanks! How wonderful that these pollinators arein your garden Gail. 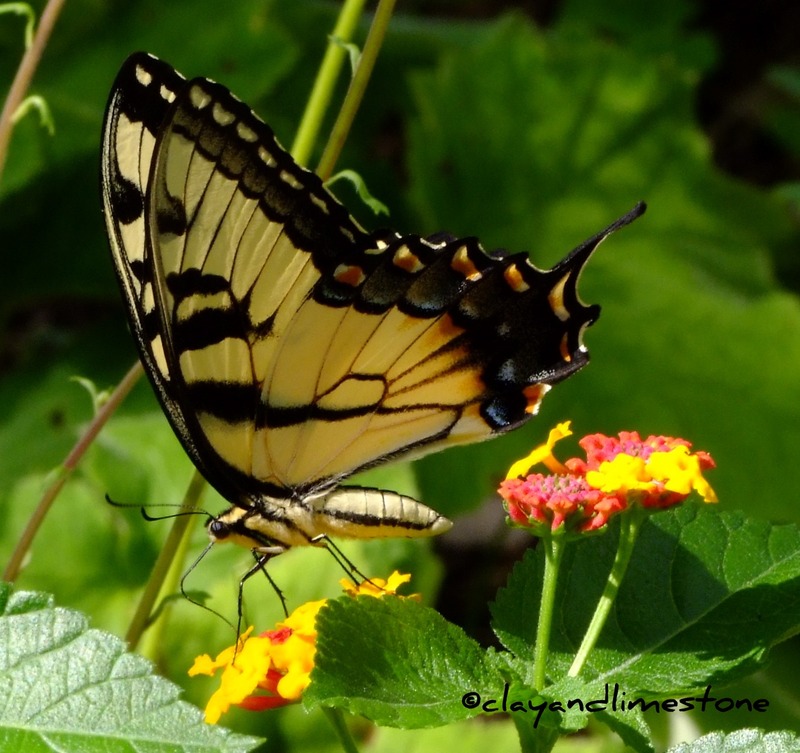 I saw the FOY (first of the year) Tiger Swallowtail this past weekend. None in my garden yet. It is such an exciting time of year when our pollinator friends once again grace our garden. I love this post, Gail. It always feels good to me to think about what will use this plant (eg, does this plant work for a living). And pollinators are so under siege, with the barrage of everything from 'bug-b-gone' to imidacloprid and its relatives. Yikes. But, I'm like you -- I do make room for tulips, camellias, and other plants that make me happy just because they're beautiful! Ooo, I love the picture of the wasp on the ragwort and the Swallowtail. Perfectly beautiful. Gail these have been an excellent series of posts. I have enjoyed them very much! Gail, I so agree with Sweetbay! Your series about pollinators is simply superb. The illustrations of your beautiful photographs so inspiring too. Stunning Swallowtail shot in this post!